To have a PET scan, patients are injected with a radioactive sugar molecule that attaches to tumors. If the tracer does not attach properly, the scan may not produce reliable images, and a second scan may be needed. One reason the radiotracer does not attach is that is that it leaks into surrounding tissues — what doctors call "infiltration." Researchers at The University of Tennessee Medical Center are part of a nationwide quality improvement project led by Lucerno Dynamics to assess and reduce infiltration. Traditionally, infiltration is only confirmed if the injection site for the radiotracer is within the PET field of view. Even if the injection site is inside the field of view, the tracer may spread through tissue and not be visible on the images. However, Lucerno Dynamics has developed technology to assess injection quality, which ultimately helps radiologists determine the success of a scan and aids physicians in recommending the best treatment. 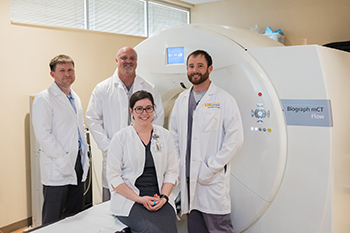 Through this quality improvement project, Dustin Osborne, PhD, Associate Professor of the Molecular Imaging and Translational Research Program, and his study team including nuclear medicine technologists in the Department of Radiology found their infiltration rates were 2.1 percent for the initial 10 week assessment period, among the lowest of the participating nationwide institutions. Initial results from phase one of the study have indicated some areas where the team can focus to further improve the rate of infiltration which will be implemented later this year. 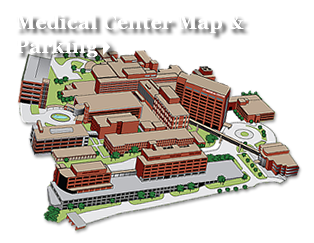 The medical center has also been invited to participate in a follow up study that will compare the infiltration data to patient scans to determine whether a scan should be repeated based on reduced image quality.